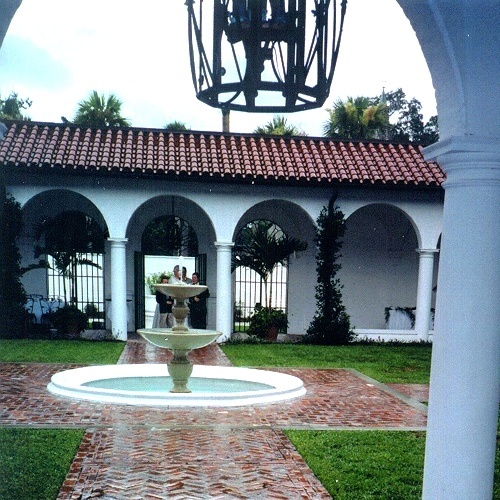 Our first experience with the Jekyll Island Club Hotel was our visit for a family wedding in the spring 2003, which was held at this historic colony located on Jekyll Island, the smallest of Georgia's "Golden Isles". Jekyll Island is seven and a half miles long and one and a half miles wide, and boasts ten miles of beautiful white beaches, super for shelling and swimming. What a glorious setting for a family celebration. The Club, founded in 1886, was once the luxurious playground resort for some of America's wealthiest families (the Pulitzers, the Goodyears, the Vanderbilts, the Morgans, the Rockefellers to mention a few) who arrived for the winter in their yachts and in private rail cars. As I walked the grounds, I found myself trying to imagine what it must have been like for those experiencing this magnificent place so many years ago. The resort consists of 157 rooms and suites all situated in beautiful lush gardens - just exquisite. 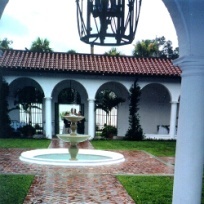 Guests are able to stay in the main hotel building, the Annex to this building, and the Sans Souci, in addition to two cottages on the grounds, places where the wealthy used to stay. Walking the grounds is a wonderful way to enjoy the surroundings. In addition, one can keep very busy with several activities available - everything from supreme relaxation at the riverfront pool, croquet, bicycling, golf on the putting green and charter fishing. Nearby on the island you can enjoy many other activities, including horseback riding on the beach, golf on the championship course, tennis at the Island Tennis Center - the list goes on and on. Of course, on such a small island, everything is close at hand. The menu offered at the wedding reception at the Crane Cottage was just delectable. In addition, we also had a delightful luncheon in the Crane Courtyard, and a beautifully served breakfast in the Grand Dining Room in the Club Hotel. We hear that they also serve a wonderful Sunday Brunch. Even though our stay was not very long, we know that this is a place worth returning to. Give Jekyll Island a try if you're looking for something close and very unique!